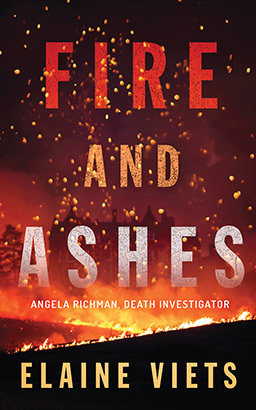 In the exclusive, gated enclave of Olympia Forest Estates, death investigator Angela Richman watches a mansion go up in a fiery blaze. With it, seventy-year-old financier Luther Delor, a drunken, bed-hopping rhinestone cowboy. Embroiled in a bitter divorce, Delor may have scandalized Chouteau Forest, but his murder has united it against the accused: Delor's twenty-year-old girlfriend, Kendra Salvato, an "outsider." With an engagement ring bigger than Chouteau County, she's being railroaded straight to death row as a gold-digging killer. All there is against Kendra is vicious gossip and anti-Mexican rage, and both are spreading like wildfire. Meanwhile, Angela is trying to douse the flames with forensic work that's putting the Forest on edge. After all, facts could implicate one of their own. Now, sifting through the ashes of a vicious crime-and the guilty secrets of the privileged-only Angela can get to the truth, and prevent an innocent woman from getting burned.